Okay, okay, so I know it’s just a slightly-tapered-at-the-corners square, but I’m pretty excited about this adorable little pillow I managed to whip up last night with some superhero fabric and grey linen. I’m thinking about offering them in the Etsy shop. I was selling more quilts for a while, then got lazy busy and haven’t had the time to restock. Maybe pillows would be a good start? I love this Superkids fabric from Ann Kelle enough that I didn’t even do anything special to it. Just some curved corners, French seams and a linen back–bam, a new pillow. Of one kind or another, it’s all I’ve been thinking about. My son graduates high school on Saturday and I feel faint at the thought of it, but the party afterward–can’t wait! 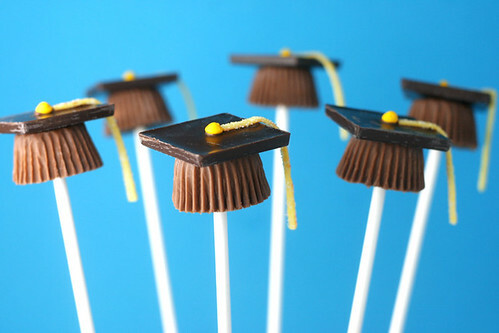 I am hoping to get the time to make these adorable grad caps out of chocolate that I found on Craft. They originally came from Bakerella and she’s got a spiffy little tutorial on how to make them, both in brown and blue. Sweet! I’m going to be making up other undecided-as-of-yet foods, as well and I’m sure all of Friday will be spent prepping for the whole mix of family and friends. But the chaos of the day will be worth it; he will be on his way to adulthood. Yay for him! And a week later, it’s the PDX Etsy party! With a day filled with crafty fun (freestyle embroidery! Japanese papercutting! Mighty Ugly!?) and quilting, then the evening filled with prizes and food and even more crafts… There’s just too much enjoyment potential. It’s gonna be great, really. I’ve had the opportunity to help out a bit on the planning and I’m stoked. If you’re in Portland, come on down. If you’re elsewhere, how are you celebrating Etsy day?